Does a Fighter's Winning Streak Matter When Predicting Outcomes in UFC Matchups? Does a Fighter's Winning Streak Matter When Predicting Outcomes in UFC Matchups? To answer that question there is a phenomenon known as the Winner Effect. Now, the question that this article is set to answer is — are UFC fighters influenced by the Winner Effect like the other animals mentioned? 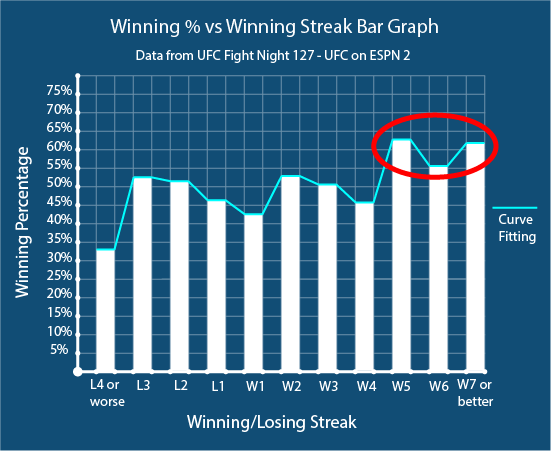 More specifically, does a streak of victories matter when predicting UFC fights? Should it even be a factor when determining which variables are important in an upcoming fight? 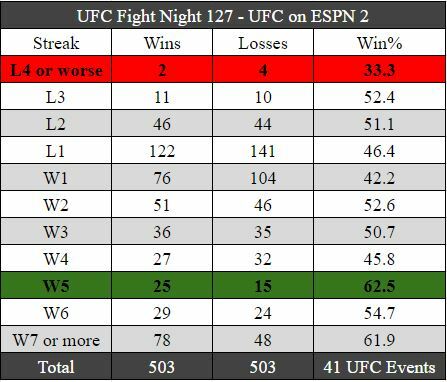 I have included a data table below that shows how often a fighter wins when they have a certain winning or losing streak going into a fight. Before we analyze that data, I want to emphasis the goal of this article. The goal of this article is NOT to suggest that a person should bet on a fight solely based on a fighter’s winning/losing streak. The goal of this article is to convince you that it must be one variable of many to consider, when analyzing an upcoming fight. I encourage people to have a collection of variables (also known as positive indicators) to assist them in predicting fights. These variables should include a fighter’s reach, hand speed, wrestling ability, BJJ skills, and many others. This article is written to present data to you that shows that a fighter’s winning/losing streak needs to be included in that list of variables. What stands out to me is the 61.9% win percentage when a fighter has won 7 consecutive times or more. The reason this stands out is because there is a sample size of 126 (78+48). I’m also surprised at how poorly fighters compete when they are either on a one fight losing streak or a one fight winning streak. Out of 180 fighters that had a one fight winning streak, only 42.2% of them won their next fight. Essentially, UFC fighters are struggling to get back-to-back wins. Pictured below is the same data that’s portrayed above except it is in a bar graph form. This graphical display will help us picture how these streaks compare to each other, in terms of their ability to win their next fight. The data table above is mainly used to display the sample sizes of each streak. Look at how a victorious stretch of 5 and above is higher than all of the other bars. I circled this section in red. This data shows that a fighter should be given a slight bit of preference when they meet this criteria. Let’s separate a winning streak of 5 or more from a winning streak of 4 or less. If you were to bet every UFC fighter that was on a winning streak of 5 or more, you would have won 60.3% of the time. That is a clear advantage. What is remarkable to me is that this data set includes a fighter making their UFC debut on a 5 fight winning streak. If we ignore debuting fighters, I believe this 60.3% number will be higher. Unfortunately, I currently don’t have data to support that. In addition to debuting fighters, the winning streak of 5 or more club are also going against other fighters on the same run. If we subtract those wins and losses, the “W5 or more” would definitely be higher. In my future matchup analysis, I plan on giving a fighter in-between a 5-10% bump in win probability when they have a winning streak of 5 or more. I will negate this bump if I watch a fighter and they look like they just beat up on some Cans in order to stack up those wins. For those who don’t know, a Can is a fighter that has no business fighting. The sample size for this data is extremely low since it rarely happens. UFC fighters don’t usually get the opportunity to continue to fight for the organization after 4 straight losses. A sample size of 6 is not big enough to draw any conclusions. If I had to venture a guess, I expect a fighter on a losing streak of 4 or more to continue to win their next fight below 40% of the time. This is the spot where a fighter has their back up against the wall. A fighter is battling for their job at this stage. Therefore, I assume they are going to perform at their best. Although, they must have some limitations in their ability, in order to lose 3 in a row in the first place. So, how well do fighters perform with their back up against the wall? Out of 21 fighters, 11 of them managed to win their next fight. That equals a 52.4% win rate. The sample size for this streak is also too small to gain meaningful information from. I’m interested to see how this data will look when the sample size is over 100. I will continue to add more data to this data set. Stay tuned for when I re-release this article with double the sample sizes. The reason I chose to release it now was to satisfy the audience that wants to see it now. Not every fighter gets another chance in the UFC organization if they lose here. So, this is also a must win situation for the majority of UFC fighters. In this situation, we have a sample size of 90 (46+44). Again, these fighters are winning their next fight above 50% of time. From those 90 mixed martial artists, the fighter on the 2 fight losing streak won 46 of them, which is a 51.1% win rate. Should you favor a fighter on a two fight losing streak? No, 51.1% is not large enough to conclude they have any advantage. When someone is on a one fight losing streak, I might be inclined to believe they learned from their losing experience. Unfortunately, with the data presented here, we don’t know if this is a fighter’s first loss, or their 5th loss. I’m willing to treat a fighter’s first loss different from their 5th loss, even though both result in the same L1 streak. I imagine that the ability to learn from a loss dissipates after each and every loss. A question that I plan to answer in the future is — how often does a UFC fighter win their next fight, after their first MMA loss. As you can see from the pictures above, fighter’s don’t perform well coming off a loss. Out of 263 fighters in this situation, only 122 won their next fight. This results in a 46.4% win rate. Why are fighters on a 4 fight winning streak losing so frequently? I’ll reserve judgment until I see a bigger sample size. The data we have indicates that fighters on a 4 fight winning streak have 27 wins and 32 losses. Assuming this trend continues, written below are some hypotheses as to why the trend exists. 1. Fighters take a big step up in competition after winning four straight. 2. Most competitive advantages have dissipated after four straight wins. 3. A fighter gets exposed for some weakness in their game after four straight wins. How do fighters on a winning streak of 5 or more have an advantage over fighters that don’t? Along with the Winner Effect, there are two other phenomenons that help explain this. “According to the Matthew Effect — victories bring reputation and recognition that can translate into tangible assets, which in turn help to bring future victories” (2). To put the Matthew Effect into a fighting parlance, a fighter has developed a reputation of success when they are on a winning streak of 5 or more. It’s no secret that reputations are extremely important. A reputation will single-handedly alter how an opponent will approach a fight. A highly touted reputation in the BJJ world might cause an opponent to completely avoid this realm. Not only are fighters starting to build a reputation after being successful in 5 straight bouts, but they will also be more committed to protecting it. Personally, the longer a streak of mine gets, the more effort I put to keep that streak alive. Not to mention the pride, self-identity, and confidence that disseminate from 5 or more consecutive triumphs. Picture this — if you walked up to 5 different attractive women on five separate occasions, and all 5 of them wanted to take you home, how would you feel when started approaching the 6th? To recap, we got the Winner Effect and the Matthew effect. Lastly, I need to introduce the Challenge Hypothesis. What is the Challenge Hypothesis? Basically, it identifies that a person has an increase in testosterone levels after winning a challenge. “For example, T levels increase in the winners of a competitive encounter such as a tennis match (Booth et al, 1989).” In mice, “testosterone plasma levels significantly increased after the final test when they had experienced two prior winning encounters, and the probability of winning a future encounter increased significantly after three prior wins independent of intrinsic fighting ability” (1). I’ll reiterate this one last time, a W5 or more streak in MMA increases testosterone, enhances a reputation, builds confidence, strengthens commitment, generates more wealth, converts more fans, and develops an impregnable pride. The question that you must now ask yourself is — in general, do you consider this to be an advantage in an upcoming fight?